Carbonated Energy Drink with Taurine, L-Carnitine, Caffeine, Ginseng and B Vitamins with Sweeteners. Calorie free + zero sugar. Monster Absolutely Zero, with B vitamins and caffeine to help reduce fatigue, increase alertness, and motivate you to work (I mean play) harder, so generally you feel pretty damn good. Caffeine to help increase alertness Vitamins B2, B3, B6 and B12 to contribute to the reduction of tiredness and fatigue into a normal energy yielding metabolism Zero Sugar, calorie free Serve cold for maximum refreshment. Store in a cool and dry place Please recycle. HIGH CAFFEINE CONTENT. 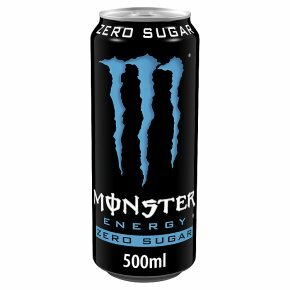 NOT RECOMMENDED FOR CHILDREN, PREGNANT OR BREASTFEEDING WOMEN, OR PEOPLE SENSITIVE TO CAFFEINE (30mg/100ml). CONSUME RESPONSIBLY AS PART OF A BALANCED DIET AND HEALTHY LIFESTYLE.